Which Building Materials Are Most Susceptible To Mold? People worry when they discover mold signs in their homes; they worry about health risks. The usual response is to “clean” the mold, but depending on the source, extent, and type of mold, this can cause cross contamination and potentially increase your exposure. When you find mold in your property, call a mold remediation specialist to properly treat, remove, and prevent more mold. Cinder block walls are strong, long-lasting and resistant to elements such as wind and rain, however, they are still subject to the effects of mold growth. Concrete is not an organic material like wood so the concrete itself does not act as a food source for mold. However, If dirt, dust, and moisture collect as a result from flooding, humidity or rain, the mold spores can settle on the wall surface and begin to grow. It also absorbs moisture so slowly; you can have significant damage before you find it. 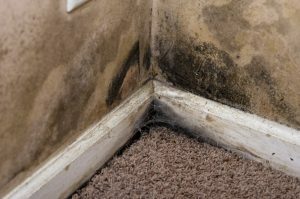 Therefore, unless the concrete is kept extremely clean, mold growth can occur so address both 1) airborne moisture by lowering the humidity and 2) removing all liquid moisture from flooding and vapor. If you notice mold growing on a concrete surface in your home, you can remove it by scrubbing the area with a mold killing solution and removing the organic materials from the surface that acted as a food source. However, you may need professional help with keeping the concrete dry. The biggest key to preventing mold is to routinely check concrete surfaces in high moisture areas and then addressing the problem at the source. Although wood is a common building material of the structural elements of a home, it is also very vulnerable to mold growth. Mold requires water and an organic food source to thrive; wood acts as both food and moisture source due to its ability to absorb water. In time, mold will eventually destroy wood surfaces as it feeds on the nutrients. Removing mold from wood may be as simple as using a mold killing solution but the wood must be thoroughly dried. Using professional techniques and equipment, a professional team like Sierra Restoration can ensure that no moisture is left. Of these materials, drywall is the most porous surface and once mold starts to grow on drywall, it cannot be removed. Because drywall is a substance high in cellulose, it is one of the most common materials of mold contamination. Drywall that is contaminated by mold must be cut out and removed so that it can be replaced by new drywall. And mold commonly grows out of sight behind drywall in the wall cavities. These spaces often contain pockets of humid, moist air. Mold can also grow hidden behind wallpaper; its glue can hold organic debris as a food source for mold growth. Contact a professional to inspect behind the drywall with minimal impact to the wall surfaces. Since 2010, Sierra Restoration has treated each assignment not just as a job, but as an opportunity to help a friend; at Sierra Restoration, customers are family. When you contact Sierra Restoration for your mold clean up needs, you don’t just get a highly-experienced team that specializes in high-quality water removal and cleanup services, but you are choosing a company that is fully licensed to handle all reconstruction work that may need to happen after any water or mold problem.